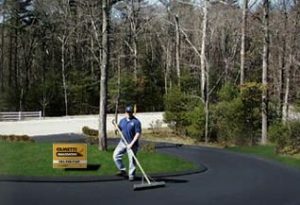 Adding a protective, sealcoat layer on top of asphalt is a must to protect your investment in a driveway or parking lot. Cametti Sealcoating purchases a factory fresh, undiluted, heavy-duty Taconite product distributed by KOL-TAR Inc. that fills asphalt’s porous surface, preventing water and fuel penetration. Because it’s rubberized, it provides superior protection over other tar-based products. What’s more, our product is applied by hand using a squeegee. We do not use sprayers to apply the product, which would require the product be diluted up to 40%, making it weaker and less effective at protecting your asphalt. We use fresh product every day to ensure a superior quality that better protects the surface and lengthens the life of your driveway or parking lot. Every job starts with a thorough cleaning of the asphalt surface. We use a high pressure blower to remove sand and debris, providing a stronger bond and longer life for the product. Voids left from cracks are filled before applying the sealcoating, to prevent further damage from water and weather exposure. If the asphalt has weathered to the point where sealcoating can no longer protect it, we will review your options when providing you a quote. Oil and gas stains are scrubbed and treated to prevent petroleum from further damaging the asphalt, and providing a stronger bond for the sealcoating. For parking lots, we restore all parking lines and demarcations after the sealcoating is applied and dry. We have flexible schedules to work around your business hours or high use times of a parking lot, minimizing the impact.